For those players who have pre-qualified or qualified at one of our qualifying tournaments, this is the last chance to register online for the Invitational. Players must withdraw no later than midnight on the closing date to receive a full refund. Players withdrawing are subject to a $25 administrative fee. Players withdrawing after tee times are released will not receive a refund. The practice round is included in your entry fee. There will be a single tee start on Friday, November 11 beginning at 11:00 AM; tee times are available every 10 minutes. Players must book their tee times directly with the PKB Tour by email (golf@pkbgt.org) starting Wednesday, October 26th at 9:00 AM. Join us in celebrating the year on the Peggy Kirk Bell Girls' Golf Tour! 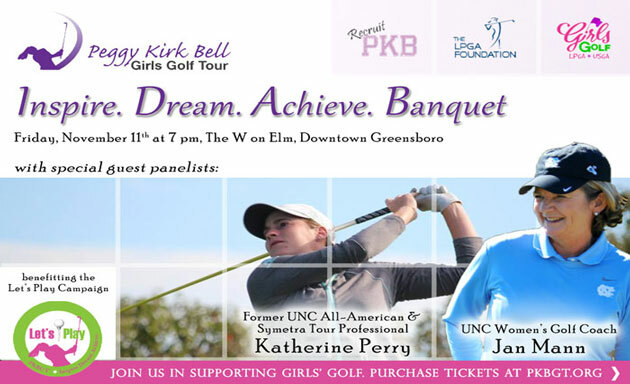 With special guest panelists, UNC Chapel Hill Women's Golf Coach Jan Mann and former PKBGT Alumna, former UNC Chapel Hill NCAA All-American and current LPGA Symetra Tour professional Katherine Perry. Event held at the W on Elm in downtown Greensboro and is included in the entry fee for all event participants. Additional tickets will be able to be purchased for parents and guests by clicking here. We look forward to a great event, recognizing our champions of 2016. Round 2 will be a 11 AM shotgun start for all players, weather permitting. Range & Putting Green will open as soon as the projected frost is gone.